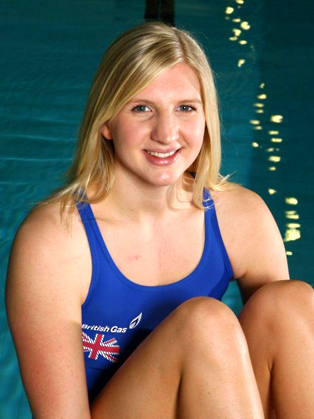 Arguably Britain's highest profile and most popular female athlete, Rebecca Adlington became a household name following her two gold medal winning performances at the Beijing Games in August 2008. Rebecca is the first British swimmer to win more than one gold medal at a single Olympic Games since Henry Taylor in 1908. Despite winning her favourite event, the 800m freestyle, at the 2008 World Short Course Championships a few months prior to Beijing, Rebecca went into the Olympics relatively unknown even in her own country. In a huge upset, Rebecca won her first Olympic gold medal in the final of the 400m freestyle with a time of 4:03.22, beating race favourite Katie Hoff (USA) and British team-mate Joanne Jackson. In doing so, Rebecca became the first woman to win Olympic swimming gold for Great Britain since Anita Lonsbrough in 1960. Three days later, Rebecca went on to win her second gold medal in the 800m freestyle final in a world record time of 8:14.10. Rebecca finished an incredible six seconds ahead of the silver medalist Alessia Filippi (Italy), her winning time breaking by two seconds the previous world record that had been set by USA's 1988 Olympic champion Janet Evans when Rebecca was just 6 months old. Until Rebecca's record-breaking swim, this was swimming's longest standing world record. Since Beijing, Rebecca has continued to impress on the world's swimming stage. Two bronze medals at the Rome World Championships and a gold medal at the Duel in the Pool against the USA were her swimming highlights in 2009. 2010 was an outstanding year for Rebecca. By winning Gold in the 400m Freestyle at the European Championships in Budapest, and Gold in both the 400m and 800m Freestyle at the Commonwealth Games in Delhi, along with numerous other medals, she has cemented her place as one of the greatest distance swimmers of all time. 2011 brought a new challenge, as Rebecca attempted to win the one major championship gold which eluded her at the long course World Championship in Shanghai. It proved to be a very succesful week, with Rebecca winning a Silver medal in the 400m Freestyle and the elusive Gold in the 800m Freestyle at the end of the week, following a tremendous race against the defending champion Lotte Friis. Out of the pool, accepting an CBE from the Queen at Buckingham Palace and winning the Laureus World Sports Awards 'Breakthrough of the Year Award' have been two of the major highlights, as her public profile and popularity continue to grow following her Beijing Olympic success. Rebecca is an ambassador of the Encephalitis Society, a national charity and the only resource of its kind in the world supporting people affected by the illness.